Confession is a God-given commandment, and it is one of the Mysteries of our Church. Confession is not a formal, habitual ("to be on the safe side", or, "in view of upcoming feast-days"), forced and unprepared act, springing from an isolated duty or obligation and for psychological relief only. Confession should always be combined with repentance. A Holy Mountain Elder used to say: "Many confess, but few repent!" (Elder Aemilianos of the Simonopetra Monastery, Holy Mountain). Repentance is a freely-willed, internally cultivated process of contrition and sorrow for having distanced ourselves from God through sin. True repentance has nothing to do with intolerable pain, excessive sorrow and relentless guilty feelings. That would not be sincere repentance, but a secret egotism, a feeling of our "ego" being trampled on; an anger that is directed at our self, which then wreaks revenge because it is exposing itself and is put to shame - a thing that it cannot tolerate. Repentance means a change in our thoughts, our mentality; it is an about-face; it is a grafting of morality and an abhorrence of sin. Repentance also means a love of virtue, benevolence, and a desire, a willingness and a strong disposition to be re-joined to Christ through the Grace of the almighty Holy Spirit. Repentance begins in the depths of the heart, but it culminates necessarily in the Mystery of divine and sacred Confession. During confession, one confesses sincerely and humbly before the confessor, as though in the presence of Christ. No scientist, psychologist, psychoanalyst, psychiatrist, sociologist, philosopher or theologian can replace the confessor. No icon - not even the most miracle-working one - can provide what the confessor's stole (epitachelion) can: the absolution of sins. 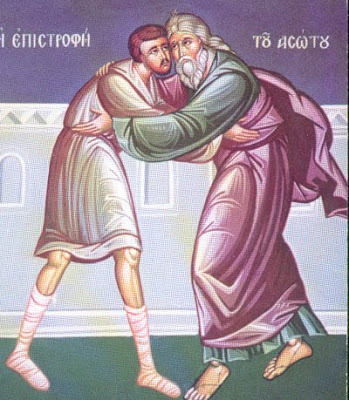 The confessor takes the person under his care; he adopts him and ensures he is reborn spiritually, which is why he is called a "spiritual father". Normally, spiritual paternity is lifelong, sacred and powerful - even more powerful than a family bond. Spiritual birth is a painful process. The confessor must keep track of the confessing soul, with a fear of God (as one who is "accountable to God"), with understanding, humility and love, and guide him with discretion in the ever-upward course of his in-Christ life. The confessor-priest has been given a special blessing by his bishop for the undertaking of his confessional opus. However, the gift of "binding and unbinding" sins is initially acquired through his ordination as presbyter, when he is rendered a successor to the Apostles. Thus, validity and canonicity in Apostolic succession, through bishops, is of central and great importance. Like all the other Holy Mysteries of our Church, the Mystery of Confession is performed (and it bestows Grace on the faithful), not in conjunction with the skill, the scientism, the literacy, the eloquence, the energy and the artfulness of the priest - not even with his virtue and holiness - but through the canonicity (validity) of his priesthood and through the "Master of Ceremonies" - the Holy Spirit. The possible sins of the priest do not obstruct divine Grace during the Mysteries. Woe to us, if we were to doubt (on account of the unworthiness of the priest) that the bread and the wine actually become the Body and the Blood of Christ during the Divine Liturgy! 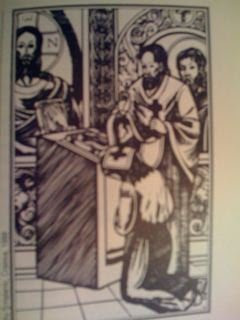 This of course does not mean that the priest should not have to constantly concern himself with his own "cleanliness". Thus, there is no such thing as "good" or "bad" confessors. Each and every confessor provides the exact same absolution. However, we do have the right to choose our confessor; and of course we have the right to turn to the one who truly makes us feel at ease with him, spiritually. To constantly change our confessor however, is not a very sober decision; this kind of tendency does not reveal spiritual maturity. But confessors should, respectively, not fret excessively -or even create problems- when a spiritual child of theirs happens to depart from them. This may mean that they were morbidly attached to each other (sentimentally to the person, and not to Christ nor to the Church). They may also regard that departure as an insult; one that is demeaning to them and makes them think there is no one better than them, or, it may give them a feeling that the other "belongs" to them exclusively and they can therefore dominate them and in fact even behave forcibly towards them, as if they are repressed and confined subordinates. We did mention that the confessor is a spiritual father, and that spiritual fatherhood and spiritual childbirth entails labour. Thus, it is only natural for the confessor to feel sorrow upon the departure of his spiritual child. However, it is preferable for him to pray for his child's spiritual progress and its union to the Church, even despite its disengagement from him. He must wish for, and not against that child. The confessor's opus is not just the superficial hearing of a person's sins and the reciting of the prayer of absolution afterwards. Nor is it restricted to the hour of confession. 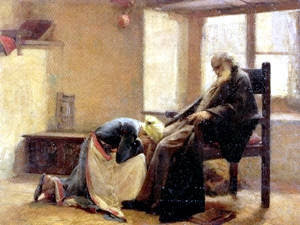 Like a good father, the confessor continuously cares for his child; he listens to it and observes it carefully, he counsels it appropriately, he guides it along the lines of the Gospel, he highlights its talents, he does not place unnecessary burdens on it, he imposes canons with leniency only when he must, he consoles it when it is disheartened, weighed down, resentful, exhausted, and he heals it accordingly, without ever discouraging it, but constantly pursuing the struggle for the eradication of its passions and the harvesting of virtues; constantly shaping its eternal soul to be Christ-like. This ever-developing paternal and filial relationship between confessor and spiritual child eventually culminates in a feeling of comfort, trust, respect, sanctity and elation. When confessing, one opens his heart to the confessor and discloses the innermost, the basest and most unclean - in fact, all of his - secrets, his most intimate actions and detrimental desires, even those that he would not want to confess to himself, nor tell his next-of-kin or his closest friend. For this reason, the confessor must have an absolute respect for the unlimited trust that is being shown to him by the person confessing. This trust most assuredly builds up with time, but also by the fact that the confessor is strictly bound (in fact to the death) by the divine and sacred Canons of the Church, to the confidentiality that confession entails. 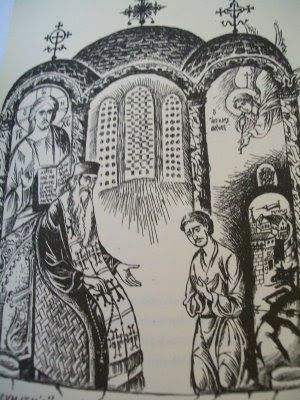 In Orthodox confession there are of course no general instructions, because the spiritual guidance that each unique soul requires is entirely personalized. Each person is unprecedented, with a particular psychosynthesis, a different character, differing potentials and abilities, limitations, tendencies, tolerances, knowledge, needs and dispositions. With the Grace of God and with divine enlightenment, the confessor must discern all these characteristics, in order to decide what he can utilize best, so that the person confessing will be helped in the best possible manner. At times, leniency will be required, while at other times, austerity. The same thing does not apply to each and every person. Nor should the confessor ALWAYS be strict, just for the sake of being called strict and respected as such; and he should likewise not ALWAYS be excessively lenient, in order to become the preferred choice and be regarded as a "spiritual father of many". What is required of him is a fear of God, discernment, honesty, humility, deliberation, understanding and prayer. "Economy" (Oikonomia: to make allowances for something, exceptionally) is not demanded of the person confessing, nor is it proper for the confessor to make it a rule. "Economy" must remain an exception. "Economy" must also be a temporary measure (Archimandrite George Gregoriates). When the reasons for implementing it no longer exist, it must naturally be retracted. The same sin can be confronted in numerous ways. 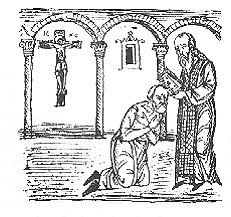 A canon is implemented for the purpose of completing one's repentance in view of confession, which is why Fr. 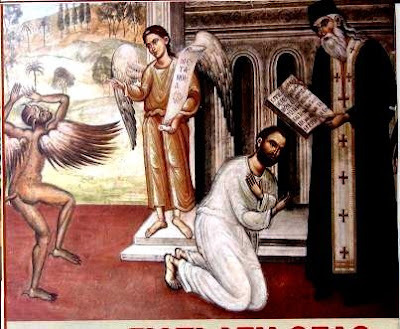 Athanasios of Meteora rightly says: "Just as the confessor is not permitted to make public the sins being confessed to him, so must the person confessing not make public the particular canon that the confessor has imposed in his specific case, as it is the resultant of many parameters." A confessor acts as the provider of the Grace of the Holy Spirit. During the hour of the Mystery of Confession, he does not function as a psychologist and scientist. He functions as a priest, as an experienced doctor, as a caring father. When listening to the sins of the person confessing, he prays to God to give him enlightenment, to advise him what the best "medication" for cure will be, and to gauge the degree and the quality of that confession. The confessor does not place himself opposite a confessing person with curiosity, suspicion, envy, excessive austerity, power and arrogance; but equally not with indifference, thoughtlessly, carelessly and wearily. The humility, love and attention of the confessor will greatly help the person confessing. The confessor should not ask too many, too unnecessary and too indiscreet questions. He must especially interrupt any detailed descriptions of various sins (especially the carnal ones) and even the disclosure of names, to safeguard himself even more. But the person confessing should also not feel afraid, or hesitate and feel embarrassed; he should feel respect, trust, honor and show reverence to the confessor. This feeling of sanctity, mutual respect and trust must be mainly nurtured, inspired and developed by the confessor. Our holy mother the Orthodox Church is the Body of the Resurrected Christ; She is a vast infirmary, for the healing of frail, sinning faithful from the traumas, the wounds and the illnesses of sin; from pathogenic demons and from the venomous demonic traps and the influences of demonically-driven passions. Our Church is not a branch office of the Ministry of Social Services, nor does She compete against the various societies for social welfare - without this meaning that She does not acknowledge this significant and well-meaning opus, or that She Herself does not offer such services bounteously, admirably and wondrously; it is because the Church is mainly a provider of a meaning to life, of redemption and salvation of the faithful "for the sake of whom Christ died", through their participation in the Mysteries of the Church. "The priest's stole is a planing instrument" - as the Elder Paisios of the Holy Mountain used to say - "that planes and straightens out a person; it is a therapeutic scalpel that excises passions, and not a trowel for workaholics, or a symbol of power. It is a servant's apron intended for ministering to people, for providing therapy and salvation." God uses the priest for the forgiveness of His creature. It is plainly stated in the absolution blessing: "May God forgive you - through me the sinner - everything, both in the present age and in the future one, and may He render you blameless, before His awesome Seat of Judgment; having no longer any worry for the crimes that have been confessed, may you go forth in peace." Sins that have not been confessed will continue to burden a person, even in the life to come. Confessed sins should not be re-confessed; it would be as though one doesn't believe in the grace of the Mystery. God is of course aware of them, but it is for the sake of absolution, humbling and therapy that they need to be outwardly confessed. As for the occasional penance (canon) imposed for sins, one must realize that it does not negate the Church's love for the person, but that it is simply an educative imposition, for a better awareness of one's offenses. 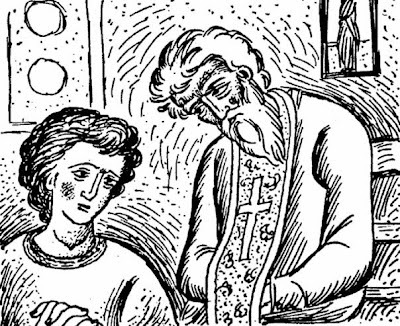 According to Saint Nicodemus of the Holy Mountain, "Confession is a willed, verbal revealing of one's evil deeds and words and thoughts; solemn, accusatory, direct, without shame, decisive, to be executed before a legitimate spiritual father." This God-bearing Saint has succinctly, fully and meaningfully clarified that confession must be willed, free, effortless, without the confessor straining to extract the person's confession. It should be with solemnity, in other words, with an awareness of the sorrow that he caused God with his sin, and not with sentimental, hypocritical, fainthearted tears. Genuine "solemnity" implies an inner collapsing, remorse, a hatred towards sin, a love of virtue, and a feeling of gratitude to the Gift-Giver God. "Accusatory" implies a responsible confession, without attempts of justification, subterfuge, chicanery, irresponsibility and scapegoating; with sincere self-reproach and genuine self-humiliation that carries the so-called "happy-sorrow" and the "joyous bereavement" defined by the Church. "Direct" implies a confession with all sincerity, directness and precision, valor and courage, severity and bravery. 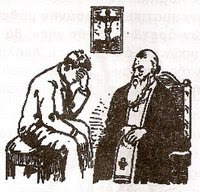 It often happens that during the hour of confession, one avoids admitting his defeat, his fall and his weakness and by means of eloquent and long-winded descriptions attempts to deflect his share of responsibility, with twists and turns and half-truths - or even by accusing others - all for the sake of preserving (even at that hour) a prim and proper ego. A confession "without shame" implies a portrayal of our true, deplorable self. Shame is a good thing to have, prior to sin and not afterwards, and in the presence of the confessor. The shame felt during confession they say will free us from the sin during the Ultimate Judgment, given that whatever the confessor absolves will not be judged again. A "direct" confession implies that it should be clean, specific, sincere, and accompanied by the decision that the faithful will never repeat the sins he has confessed to. Furthermore, confession should be continuous, so that the "willingly recurring" passions (according to Saint John of the Ladder) are not strengthened, but rather, are cured sooner. Thus, old sins will not be entirely blotted out from memory, there will be a regular self-monitoring, self-observation, self-awareness and self-reproach; Divine Grace will not abandon; demonic entrapment will be averted much more easily, and reminiscence of Death will not seem as horrid and terrible. Another thing that is all too frequently observed - and we admit this with deep pain and abundant love - is that sermons are not always as Orthodox as they should be; in other words, they only manage to sound like just another commentary on an unimportant news item, thus transforming the sacred pulpit into yet another television "frame" where we can air our own opinion on daily events and occurrences. The Orthodox sermon however is by nature mainly ecclesiological, Christological, salvatory, hagiological and beneficial to the soul. The sermon on repentance as delivered by the Prophets, the holy Baptist, the Savior Christ and all the Saints remains forever opportune and a necessity. A basic prerequisite for partaking in the Holy Mysteries and for an upward spiritual course is a purity of heart; a purity that is rid of miscellaneous sins; the spirit of avarice and blissfulness inspired by today's hyper-consumerist society; the spirit of God-despised pride in a world of narcissism, individualism, non-humility, non-philanthropy, arrogance and the bizarre; the demonic spirit of mischievous thoughts, fantasies and imaginations and unclean and obscure suspicions and envy. Purity of heart has become a rare ornament - in brotherly and conjugal relations, in obligations towards colleagues, in friendships, in conversations, in thoughts, in desires, in pastoral callings. The so-called Mass Media have lapsed and become mere sources of contamination. Forgotten are neptic awareness, ascetic sobriety, traditional frugality, simplicity and gallantry. This has led to a polluting of the soul's rationalizing ability, an arousal of its desirous aspect towards avarice, while its willpower has become severely blunted, thus drawing a weakened person towards evil, without any impediments or limitations. Nowadays prevail self-justification, excuses for our passions, beautification of sin, and its reinforcement through modern psychological supports. The admission of mistakes is regarded as belittlement, weakness and generally improper. The constant justification of our self, and the meticulous transferal of responsibilities elsewhere have created a human being that is confused, divided, disturbed, worn-out, miserable and self-absorbed, taunted by the devil, and captured in his dark messes. There is a prevalence of foolish rationalism nowadays, which observes evangelical virtues and conciliar canons according to its liking, preference and convenience, on important issues such as fasting, abstinence, childbearing, morality, modesty, honesty and precision. In view of all the above - none of which I believe has been exaggerated - it is our belief that the opus of a confessor is not an easy one. Ordinary coercion to repent and the cultivating of humility are nowadays inadequate; the fold requires catechesis, re-evangelizing, spiritual training, as well as a spiritual about-face, in order to acquire powerful antibodies. Resistance, reaction and the confronting of the powerful current of de-sanctification, of secularization, of demoting heroism, of eudemonism and of amassing wealth are imperative. The young generation is in need of special attention, instruction and love, given that their upbringing has not proven to be of any help in their becoming aware of the meaning and the purpose of life, or of the void and the indecorousness, the lawlessness and the darkness of sin. Another serious problem - even for our Christians - is the often over-zealous quest for a laborless, toil-free and grief-free life. We are in search of Cyreneans to carry our crosses. We refuse to lift up our own personal cross. We have no idea of the depth and breadth of our own cross. We bow in reverence before the Cross in church, we cross ourselves, but we do not embrace our personal cross. In the long run, we would like a non-crucified Christianity. But there cannot be an Easter Sunday without a Good Friday. We honor martyrs and saints, but we ourselves do not want to suffer any hardships, any postponements, any difficulties. Fasting is too difficult a task to accomplish; we feel resentful during an illness; we cannot tolerate any harsh words, not even when we are to blame, therefore how could we possibly tolerate injustice, slander, persecution and exile, the way our saints did? It is an indisputable fact that the contemporary, secular spirit of convenience, leisure and excessive consumerism has greatly affected the measure of spiritual living. Generally speaking, we demand a non-ascetic Christianity. Orthodoxy however has the ascetic Gospel as its basis. One other serious problem of our time is man's morbid and undue reliance on logic, intellect, knowledge, and personal judgment - we are referring to the over-fed and ultimately tiring rationalization. Neptic Orthodox theology teaches us to consider our Nous a tool, and to lower it, into the Heart. Our Church does not cultivate and produce intellectuals. To us, rationalization is not a philosophical mentality, but a clearly sin-oriented life view - a form of atheism - since it goes contrary to the commandment of placing our faith, hope, love and trust in God. A rationalist judges everything using the filter of his own mind and only with his finite mind, with himself and his sovereign ego as the epicenter, and does not place any trust in divine Providence, divine Grace and divine Assistance in his life. By often regarding himself as infallible, a rationalist does not allow God to intervene in his life and therefore judge him. That way, he is convinced that he is not in need of confession. Saint Symeon the New Theologian says however that, for one to believe he has not fallen into any sins is the greatest of falls and fallacies, and the greatest sin of all. Certain newer theologians speak of "missing the target" and not of "sinning", in their desire to blunt the natural protesting of one's conscience. The self-sufficiency displayed by certain churchgoers and fasting Christians can at times be hiding a latent pharisaic stance, i.e., that "they are not like the others" and therefore are not in need of confession. According to the Holy Fathers of our Church, the greatest of evils is Pride; it is the mother of all passions, according to Saint John of the Ladder. It is the mother of many offspring, the first ones being vainglory and self-vindication. Pride is a form of denial of God; it is an invention of wicked demons, the result of too much flattery and praise, which in turn results in a debilitation and exhaustion of man, God-despised censure, anger, rage, hypocrisy, the lack of compassion, misanthropy, and blasphemy. Pride is a passion that is formidable, difficult, powerful and hard to cure. Pride is also strong in many ways, and with many faces. It manifests itself as vainglory, boastfulness, conceit, arrogance, presumptuousness, swell-headedness, insolence, self-importance, megalomania, ambition, self-love, vanity, avarice, flesh-loving, a love for leadership, accusations and arguments. Also as smugness, favoritism, insolence, disrespect, outspokenness, insensitivity, contradiction, obstinacy, disobedience, sarcasm, stubbornness, disregard, indignity, perfectionism and hypersensitivity. Finally, pride can lead to impenitence. The tongue often becomes the instrument of pride, through unchecked, long-winded, useless talking; gossiping, silliness; vain , insincere, indiscreet, two-tongued, diplomatic, pretended and mocking conversations. Out of the seven deadly sins many other passions spring forth. Having mentioned the offspring of Pride, we then have Avarice, which gives birth to the love of money, greed, stinginess, lack of charity, hardheartedness, fraud, usury, injustice, deceitfulness, simony, bribery, gambling. Fornication manifests itself in myriads of ways, for example, envy - with its underhanded and evil spite, insatiable gluttony, anger, as well as suspect negligence and lack of care. Special attention should also be paid to many un-Orthodox elements in family life, which we believe should be examined carefully by confessors and the persons involved. The avoidance of childbearing, the idolizing of one's children (when regarded as the extension of the parents' ego), overprotecting them, or constantly watching their moves and savagely oppressing them. Marriage is an arena for exercising humility, mutual leeway and mutual respect, and not the parallel journey of two egotisms despite a lifelong coupling and coexistence. The devil dances for joy whenever there is no forgiveness in human weaknesses and in everyday mistakes. Parents will help their children significantly, not with excessive courtesy outside the home, but with their peaceful, sober and loving example in the home, on a daily basis. The participation of the children together with the parents in the Mystery of Confession will fortify them with divine Grace in an experiential life in Christ. When parents ask for forgiveness with sincerity, they simultaneously teach their children humility, which destroys all demonic plots. In a household where love, harmony, understanding, humility and peace bloom, there the blessings of God will be bounteous and the home becomes a castle that is impervious to the malice of the world around. The upbringing of children with the element of forgiveness creates a healthy family hearth, which will inspire them and strengthen them for their own futures. One other huge matter that constitutes an obstacle for repentance and confession is self-vindication, which plagues many people of the Church also. Its basis is, as we mentioned earlier, demonic Pride. A classic example is the Pharisee of the Gospel parable. The self-vindicating person has apparently positive elements, which he will over-praise and for which he would like to be honored and praised. He is happy to be flattered and to demean and humiliate others. He has excessive self-esteem, he vindicates himself to excess and believes that God is necessarily obliged to reward him. In the long run, he is a poor wretch, who, in his wretched state makes others wretched. He is possessed by nervousness and agitation and he is demanding, thus imprisoning himself; these are tendencies that will not allow him to open the door to divine mercy, through his repentance. An offspring of Pride is censure, which is unfortunately also a habit of many Christians, who tend to concern themselves more with others than themselves. This is a phenomenon of our time and of a society that pushes people into a continuous observation of others, and not of the self. Modern man's myriad occupations and activities do not want him to ever remain alone to study, to contemplate, to pray, to attain self-awareness, self-critique, self-control and to be reminded of death. The so-called Mass Media are incessantly preoccupied with scandal-seeking, persistently and at length, with human passions, with sins, with others' misdemeanors. These kinds of things provoke, impress, and, even if they do not scandalize, they nevertheless burden the soul and the mind with filth and ugliness and they actually reassure us, by making us believe that "we are better" than those advertised. Thus, a person becomes accustomed to the mediocrity, the tepidity and the transience of superficial day-to-day life, never comparing himself to saints and heroes. This is how censure prevails in our time - by giving man the impression that he is justly imposing a kind of cleansing, by mud-slinging at others, albeit contaminating himself by generating malice, hatred, hostility, resentfulness, envy and frigidity. Saint Maximus the Confessor in fact states that the one who constantly scrutinizes others sins, or judges his brothers based on a suspicion only, has not even begun to repent, nor has he begun any research into discovering his own sins. Many and various things can be said; but in the end, only one thing is opportune, significant and outstanding: our salvation, which we do not attend to forever. Salvation is not attained, except only through sincere repentance and clean confession. Repentance not only opens the celestial Paradise, but also the terrestrial one, with the foretasting -albeit partial- of the ineffable joy of the endless reign of the heavens and of wonderful peace, in the present time. Those who uphold the practice of confession can be the truly and genuinely happy people; pacifist and peace-bearing; heralds of repentance, of resurrection, of transformation, freedom, grace, and with the blessing of God in their souls and their lives. "God's bounteous Grace turns the wolf into a lamb", says Saint John Chrysostom. No sin can surpass God's love. There is not one sinner who cannot become a saint, if he desires to. It has been proven, by the innumerable names that are recorded in the Book of Saints. The confessor listens to confessions and absolves those confessing, under his blessed stole. He cannot however confess himself and place the stole over his own head to obtain forgiveness in the same manner. He must necessarily kneel underneath another stole to confess and be absolved. That is the way the spiritual law functions; that is the way God's Wisdom and Mercy have ordained. We cannot confess others, but not submit ourselves to confession; to not practice what we preach; to talk about repentance, but not to repent; to talk about confession, but not confess ourselves regularly. None of us can dethrone himself, and none can absolve himself. The unadvised, the disobedient, the unconfessed are a serious problem for the Church. Dear brothers and sisters, the confessor's stole can be a miraculous scalpel for the removal of malignant tumors; it can raise the dead, renew and transform the indecorous world, and bring joy to earth and heaven. Our Church has entrusted this grand ministry, this sacred service, to our priests and not to the angels, so that we might be able to approach them with ease and without fear, as fellow-sufferers and corporeal counterparts. All the above have been deposited with sincerity and not at all pretentiously, by a co-sinner, who did not aspire to play the teacher, but a co-struggling, co-student, together with you. It was merely his desire to remind you with simple and inartistic words the Tradition of our holy mother, the Church, on the ever-opportune matter of divinely-spun and divinely-blessed Repentance and the divinely-delivered and God-favoured, blessed Mystery of Confession. Taken from REPENTANCE AND CONFESSION, by Monk Moses of the Holy Mountain, "Orthodoxi Kypseli" Publications, Thessaloniki. Translated by ORTHODOX OUTLET for DOGMATIC ENQUIRIES.